The EMU PPI has decelerated in August, but it is only a technical deceleration with the year-on-year rate falling to 4.2% from July's 4.3%. Year-on-year PPI inflation remains elevated. While oil price pressures have dissipated, falling month-to-month in each of the last three months, the year-over-year gain in Brent oil prices peaked in June at a rise of 59.3%. As of August, despite the three-month 'deceleration,' the year-on-year rise is still 42.4%. And despite these recent monthly patterns, as I write this, oil prices are under upward pressure again and prices are at or near a new four-year high. As a result, oil prices and the PPI itself are probably not yet out of the woods. The correlations between Brent oil prices and the PPI for manufacturing as well as Brent's correlation with the main PPI components is on the order of 0.5 or higher; it is a strong 0.795 correlation for manufacturing PPI prices overall. These calculations were executed on 12-month percentage changes; for capital goods, the correlation is lagged by one month since the capital goods index for August is not available at the moment. However, it should be clear from the correlation that the behavior of the PPI is importantly affected by movements in oil prices and since oil has moved up and is moving up again (because of Iran sanctions imposed by the U.S.), there will be some further upside PPI distortion. The ECB has tended to look at oil price distortions as one-off events that will come and go and will temporarily impact the price indexes like the PPI and the HICP but will not affect 'inflation' in a lasting manor. The ECB has taken the position during times of oil price distortions to focus attention more on core or at least on ex-energy prices when available. The fact is that the ECB has been right to do this. After prices have bulged under the pressure of rising oil prices, they have settled back down. As long a Mario Draghi is the ECB head, I would expect this treatment to be repeated. That sort of enlightened look at inflation has been a good thing for Europe. 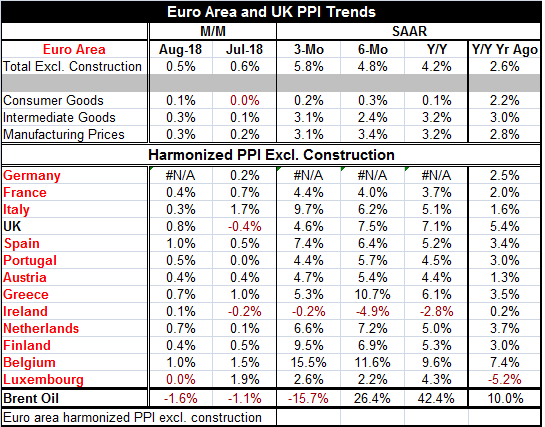 The total PPI excluding construction is showing acceleration from 12-months to six-months to three-months. But consumer goods prices in the PPI are still very moderate on this timeline and manufacturing prices are bunched up and expanding at a pace just above 3%. Even intermediate goods prices are in a 3.2% to 2.4% habitat without a progressive trend. Inflation for the headline, manufacturing, and intermediate goods is too fast but not accelerating. And in any event, these are not the targeted metrics by the ECB that looks at HICP inflation. For the group of eleven original EMU members that have reported PPI inflation this month, four of them show decelerations on three-month inflation compared to six-month trends. Only two countries show weaker PPI inflation over six months than over 12 months. Not surprisingly, because oil is up so much over the past year, inflation is up in all but one country over 12 months compared to 12 months earlier. While PPI inflation is running hot, there is no indication that it is heating up any further. In this mature position, the business cycle manufacturing sector inflation (y/y) peaked above 4% first in early-2017. It then slid to 2% by mid-2017 and was back to 3% by late-2017. From there, it slipped to 1.8% in February 2018 and now it has been on the rise again back to the 3% mark. There has been a lot of cycling of manufacturing inflation in a relatively narrow range at a time that oil prices have been oscillating. The PPI has always been more volatile than the targeted HICP. Producer prices are more volatile than consumer prices just about everywhere. So despite the high numeric value on PPI inflation, there is really nothing at work here to destabilize policy from the ECB.